Subject: Describes the seasonal round of gathering food and plant material by the ancestors of the Paiute Tribe. 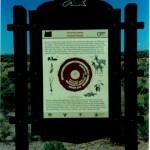 American Indians have occupied portions of the northern Great Basin for 10,000 years. The region’s earliest inhabitants lived in caves and camps along the shores of glacial lakes and marshes. 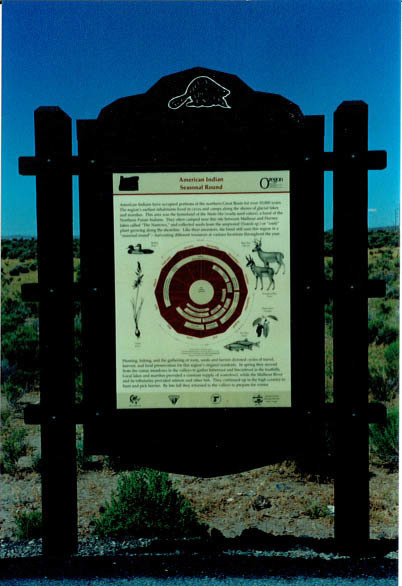 This area was the homeland of the ‘Wada-tika’ (wada seed eaters), a band of the Northern Paiute Indians. They often camped near this site between Malheur and Harney lakes called ‘The Narrows,’ and collected seeds from the seepweed (Suaeda sp.) or ‘wada’ plant growing along the shoreline. Like their ancestors, the band still uses this region as a ‘seasonal round’ – harvesting different resources at various locations throughout the year. Hunting, fishing, and the gathering of roots, seeds and berries dictated cycles of travel, harvest, and food preservation for this region’s original residents. In spring they moved from the camas meadows in the valleys to gather bitterroot in the foothills. Local lakes and marshes provided a constant supply of waterfowl, while the Malheur River and tributaries provided salmon and other fish. They continued up to the high country to hunt and pick berries. By late fall they returned to the valleys to prepare for winter.